Troops of Guwahati Frontier of Border Security Force apprehended one Bangladeshi national on Monday from the International Boundary under Dhubri district of Assam. Apprehended BD national identified as Mazum Ali, (28 yrs), is resident of Kurigram district of Bangladesh. 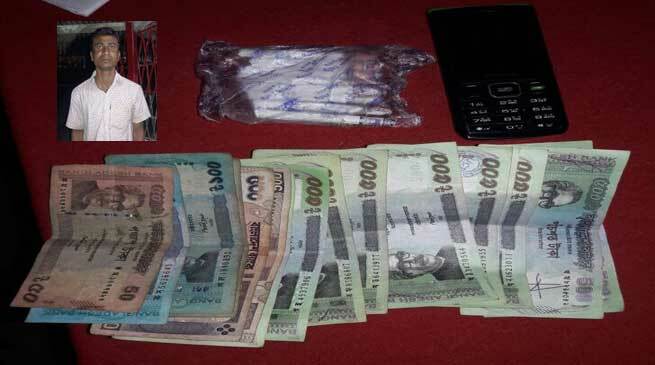 Bangladeshi taka 6,350/- and one Mobile Phone with two SIM card of Gramin Bangla and Airtel were also recovered from his possession by the troops of BOP Patamari, while he was illegally crossing International Boundary from Bangladesh to India. Apprehended Bangladeshi National and seized items were handed over to local police for legal action. Beside, BSF troops of Guwahati frontier seized 45 cattle heads having approximate value of Rs 2,44,880/- and miscellaneous items worth Rs. 69,450 /- on the intervening night of 8/9 Jan 2017. BSF troops are always alert towards the issues of trans-border crimes & illegal infiltration and are making all out efforts to prevent commission such crimes.